Trusted by studios. Relied on by airlines. CMI has been serving the in-flight entertainment industry for over 40 years. We have been working with the major Hollywood movie studios to deliver the latest feature length films and TV series localized in all key international audience languages – securely, on-time, and edited to each route’s requirements. Nowhere else is CMI’s motto of “complexity made simple” more true. The inflight industry is logistically complex, and requires the highest security to handle early content that is often viewed inflight before homevideo release. It is also technologically and organizationally complex, with one feature film alone easily resulting in over 400 unique file permutations for the different airlines, languages, and technological specs. 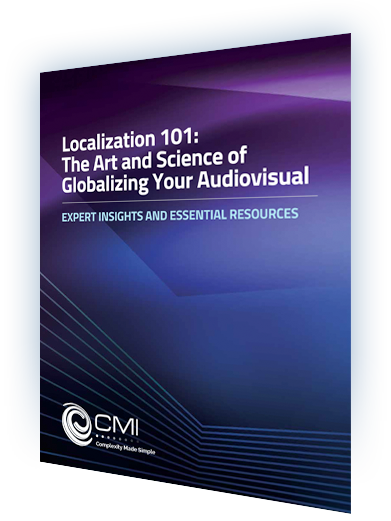 CMI often provides both dubbing and subtitling, depending upon the preference of a specific airline route’s audience. The volume is staggering, with CMI delivering two terabytes of content monthly. When filmed content must be delivered in multiple versions, formats and configurations, all over the world, securely and flawlessly, CMI is your partner. CMI holds long-standing relationships with key Hollywood Distributors and content libraries, including NBC Universal, Sony, Amazon Studios, MGM and DreamWorks, to name a few. At CMI, we bring the world of entertainment and film to global audiences around the world. How can we help you?